Kashmiri Pulao is famous for its unique taste, a little sweet, fruity and nutty dish; Loaded with the goodness of dry fruits, rich cream and some spices. This recipe which I wished to prepare for quite some time and which I managed to prepare this week. 1.Gently wash rice and soak in water for about 10-15 minutes. 2.Cook the mixed vegetables the peas, beans and carrot pieces in boiling water for 5-7 minsand keep aside. 3.In 2 tbsp of ghee, fry the cashew nuts,blanched almonds and raisins and paneer cubes for 2 mins under low heat and keep aside. 4. Heat ghee in a pan. Add cloves, cinnamon, cumin seeds, bay leaf and cardamoms. When the smell of the spices evolves, add soaked gradually and fry for 2 minutes..
5.When all of the rice has been added, Add the mixture of cream, milk, sugar and salt. Add half a cup of water. Bring to a boil. Cover and simmer till cooked. 6.In cooked rice add salt, depending upon taste. Then add thecooked veggies, cashew nuts, rains,almonds and paneer.Stir for 4-5 mins. Turn off heat and transfer to a serving bowl. 7.Finally add the fresh fruits, half of the roasted cashews and raisins and mix well. 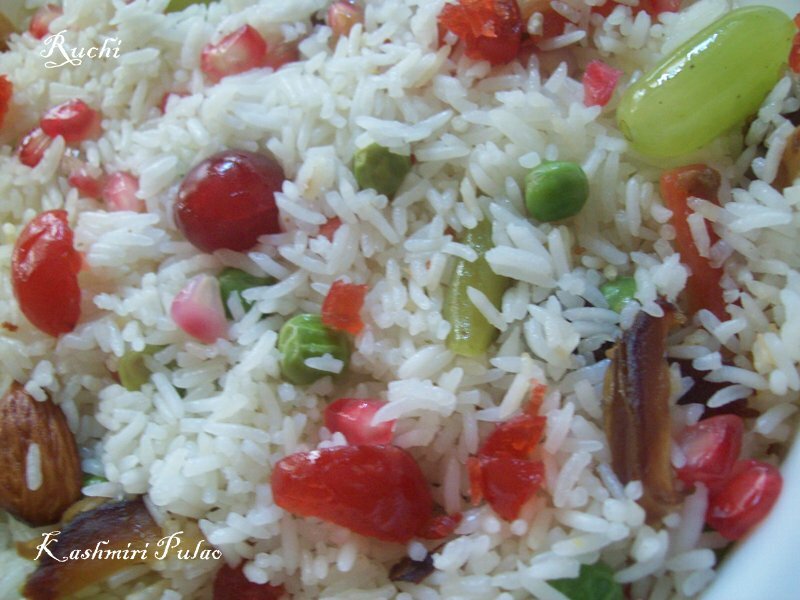 Pulao looks very nice and colourful. Pulao luks very beautiful n nice.so colourful. 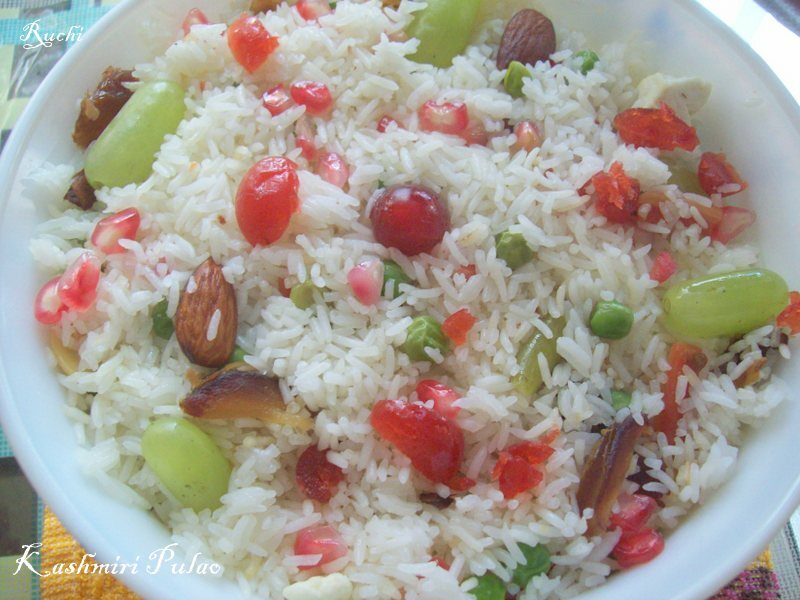 really yummy pulao... glad to be ur follower..